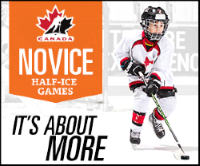 Hockey Canada has approved national policies that mandate all Novice aged players receive age-appropriate programming on half-ice surfaces effective for the 2019-20 season. This mandate will see Novice game play in HEO move to a half ice format for the start of the 2019-20 season. In response to this new mandate, and the changes it will require, Hockey Eastern Ontario has created a Novice Task Group with representatives from HEO, HEO Minor, Districts, MHAs and Officiating. The role of the task group is to develop a Branch plan and strategy for the implementation of this policy mandate. NOTE - At this time, no definitive decisions have been reached so check back periodically for updates. What is the the key driver for the shift to the new Novice format? • To have fun while playing hockey and engaging in physical activity. • To learn the fundamental skills required to play the game of hockey. • To develop and refine basic motor patterns. • To be introduced to the concepts of cooperation and fair play. Who is developing the changes to the Novice program? How can we be sure that the Hockey Canada policies will accurately represent issues relevant to Hockey Eastern Ontario? HEO has a representative on the Hockey Canada Task Team. In addition, as part of the HEO Development Committee, a HEO/HEO Minor Novice Sub-Committee has been struck. There are representatives from Districts and Associations within the branch to reflect our local issues and concerns. Will the half-ice program be mandatory? Yes. However, it is understood that there is a wide variety of programs with different local conditions so as the policies are developed, they will de designed with some degree of flexibility so local conditions can be accommodated. WiIl the new Novice program be open to IP players? No. Players under 7 years of age will not be permitted to play in the Novice program. Will there still be “tiering”? It is still anticipated that there will be tiering (where registrant levels permit) to reflect the difference in skill levels. It’s possible that there could be changes to the existing tiering models or the number of tiers as the teams continue their work. What will happen to the Novice competitive programs? Hockey Canada has not taken a position on competitive hockey only that all Novice programs must be delivered in half ice format. Will the number of players per team change? This is one of the issues that will be reviewed by the HEO Development Sub-committee. Will the new program impact program costs or result in increases/decreases in registration costs? Although the specifics of the program is still in development, it is not expected that this will have a material impacts of costs either up or down. How does this differ from IP? • The space is bigger when moving from the cross-ice model to the half-ice model. • Goaltenders are now included in the 4-on-4 half ice model. • Full size nets are now in use. • Half ice hockey is played "North-South" rather then "East-West...more like the "North-South" nature of full ice. • Referees are now added to the game. Half Ice hockey allows Novice kids to move from the cross ice model in a progressive manner while maintaining the age appropriate programming required to focus on all the objectives of the Novice program.